Mess at home is most often caused not by a person’s laziness or lack of self-respect, but simply because we can’t find places to keep all of our things. This is especially true if your living space is comparatively small. We at Bright Side have found 15 examples of home storage that prove you really can find a place for everything. To make your closet nice and tidy and free up space for new things, you have to know how to not only get rid of things you don’t need but also to fold those you do. Take a look at this article to find out how to fold everything in a compact manner — from socks to bed linen. Using dividers will allow you to effectively store your things according to size and purpose, which will then mean that you waste far less time finding what you need. Take a look at this article to find out how to bring order to your closet. It’s no secret that the space under your bed is a great place to store bed linen and other items. Yet some people have taken this a stage further and created an entire extra closet there. Ingenuity like this can make all the difference in a small apartment. This video shows how to do this while spending only the minimum amount of money. A CD organizer works brilliantly as a rack for the lids of your pots and pans. Simple ideas like this will mean you’ll never lose anything while cooking ever again. You can find more advice on how to squeeze the maximum amount of storage space out of your kitchen in this article. This sounds very obvious, but it’s an idea that many of us overlook and forget how useful it can be. It will work even better if you label every box — that way you’ll be able to find things you haven’t used recently with the minimal amount of effort. Remember that you don’t necessarily have to buy decorative boxes and containers — you can make them yourself using cardboard and sticky tape or material. Here’s a great example of how to do it. If you have a lot of shoes but not enough space for all their boxes, then you should try making this shelf for them. It’s easy enough to make with your own hands. As for those things you make use of every day — your favorite jewelry, for instance, or your cosmetics — there’s no need to hide them away. You can place them in a special holder that you made yourself or which you can easily buy in stores. A rack for your ties, beads, or belts takes up the minimal amount of space in the closet or on the wall, and this way you’ll never lose any of those small yet vitally important accessories ever again. You can buy racks of this kind or you can make them yourself. Baskets like this are perfect for storing various cleaning fluids and toiletries. They can also be hung from the wall if you haven’t got the space anywhere else. Additional storage space can be found just about anywhere with a little ingenuity, even on your shower curtains. Take a look at the instructions here. It doesn’t matter if you don’t have the luxury of an additional cupboard or storage room in your house to hide all those ugly household items away. There’s always a way out. For instance, you can now fit special wall cupboards to stow away your ironing board. Corners of the room are perfect for putting up shelves. Take a look at the instructions here to find out how to make your own corner shelf. We all have that "bag full of bags" somewhere in our home, but it looks so unsightly. Think a little more creatively, and you’ll find that there are plenty of solutions for storing them in a more convenient and attractive way. Another example that shows some things in life can be made so much simpler. Store every piece of bed linen in a set inside one of the pillowcases from that set, and then you’ll never have to search for a missing piece in the closet ever again. 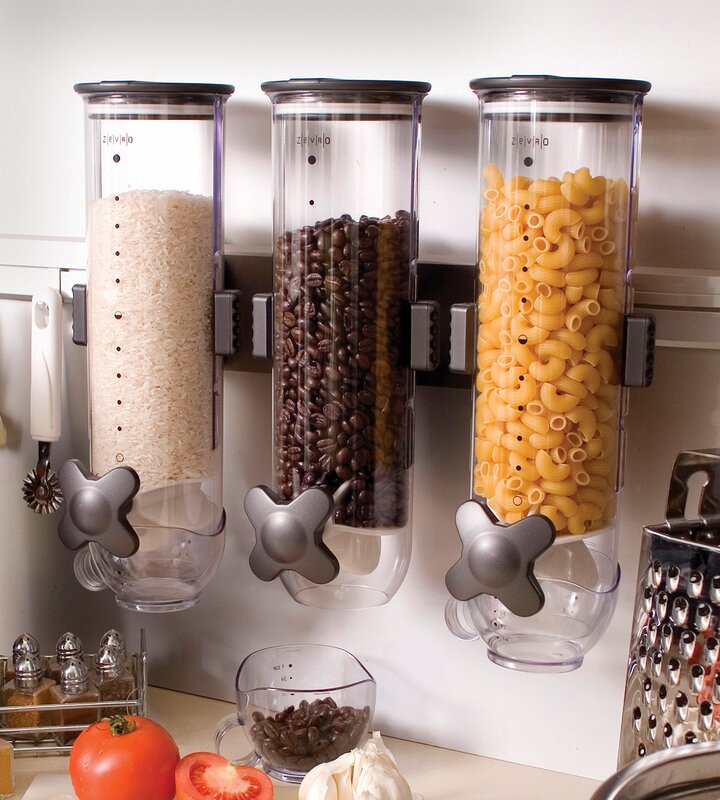 Instead of storing sugar, pulses, or pasta in their original packets and boxes, from which they can easily escape and end up making a mess in the kitchen, place them in a few separate attractive containers. Just remember to wash them occasionally.